R.A.F. Form 1767. 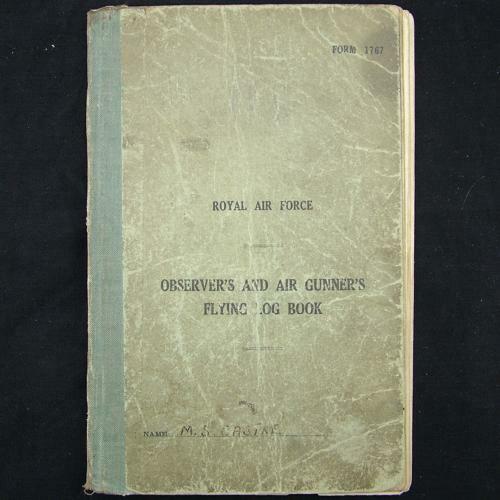 Royal Air Force Flying Observer's And Air Gunner's Flying Log Book. Named to airgunner T/Sgt. M.S. Castle (1492172) and covers the period from September 1944 to July1945. It begins with training exercises on Avro Ansons before moving on to Wellington bombers at No.30 operational training unit Gamston, Nottinghamshire during March 1945. At the beginning of July 1945 he moved to No.1661 heavy conversion unit at Winthorpe, Nottinghamshire flying Lancasters. Official entries to the log end by 27 July 1945 so he was never posted to an operational squadron and therefore all entries are training flights with no operational sorties. The log has a gunnery course stamp near the front and is signed off by the commanding officer in several places. Some of the empty/unused log pages have been used for unrelated notes, sums etc and it is evident that some middle (unused) pages have been removed as the book is quite thin. The cover is worn, creased and soiled and the inner pages are a bit dog-eared. The inner rear cover is damaged with glue/paper residue. Stock code P19859.